I needed my kids to make a booklet for all the properties of special quadrilaterals we’ve learned recently. One of my students showed me a paper-folding trick he learned that works perfectly for our needs. Apparently, there is a whole category of this stuff, called Foldables, that I was busy scoffing at during grad school. Do you have any cool folding tricks that kids like? 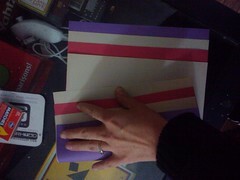 Step 1: Stack paper in a staggered pattern. 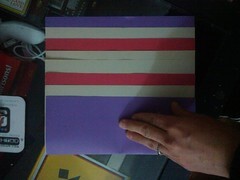 Step 2: Fold the paper from the side opposite the stagger. Step 3: Crease and staple. 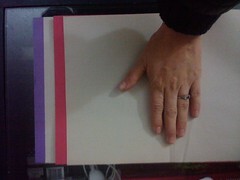 Thanks to my student Sara who texted me tonight asking how to make the fold. I sent her these images by way of explanation. Before you (or she) flip out over the matches, all I can tell you is that it’s Hanukkah at my house. The booklet will hold problems the students have created to illustrate the properties of special quadrilaterals. For example, we teach that a parallelogram’s diagonals bisect each other. The students may create a problem that shows diagonal AC has midpoint M. AM = 2x and MC = 3x – 4. They set ’em equal and then solve for x.
I’m making the kids create the problems, since we’ve solved about a million of them in the past few days. Ms. Golding is tired of creating algebraic expressions. Each page of the booklet holds problems for each quadrilateral. Someone observed my class today and remarked that he liked the task because it pushed the kids higher up Bloom’s. Eh, I was just looking for a way out of the algebraic-expression-invention game. Georgia Performance Standard (GPS) Alignment: MM1G3d, (the student will) Understand, use, and prove properties of and relationships among special quadrilaterals: parallelogram, rectangle, rhombus, square, trapezoid, and kite.